This "Average Sold Price" graph is compiled by the Utah County Association of Realtors. This graph shows the Utah County average sold price of homes. Each dot represents the exact average sold price of homes in that particular month. This graph does not include for sale by owner homes, some builder homes or custom homes that were not listed for sale on the MLS. Below the graph I will comment on where our market is currently heading. The yearly legend is located on the right side of the graph below. If you follow the youtube link a video will appear with my latest quarterly evaluation of the current market conditions. 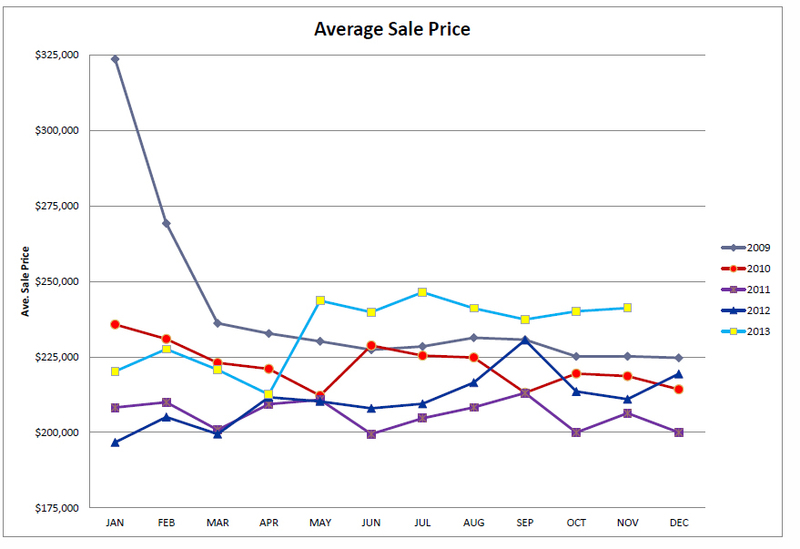 2013 - The average sold price climbed in 2013. It approached $250k in the summer. This is a sign that prices are increasing in Utah County. The market was very hot in 2012 and 2013. I don't anticipate the average sales price to break $250k in 2014. 2012 - The Utah County Real Estate Market has been stable in 2012. Homes were starting to sell again. The average price of a home broke back over the resistence level of $225,000. I think the Utah County average sold price will continue to climb into 2013. Our Utah County Real Estate Market has changed from a buyer's market to a slight seller's market. 2011 - This is the year things started to really change. The Utah County Real Estate Inventory dropped from 3,880 homes for sale down to 3,050 homes for sale. The average price of a home in Utah County dropped to $200,000. This was quite a decline from the original highs of $300,000 a few years ago. 2010 - Interest rates continued to drop in 2010 bringing many buyers into the market. The avearge sold price of a home struggled to hit $225,000 in 2010. The average sold price seemed to have a little more stability. 2009 - Buyer's were nervous during 2009 and felt confident the bottom was not in at this time. The buyer's in the market felt if they bought a bank foreclosure or short sale they would be protected from a continual price decline in the Utah County Real Estate Market. The average sold price of a home in Utah County was at $325k in January of 2012. The reason this number was so high is simple. Many of the high-end homes priced between $500,000-$1,000,000 were being dumped at this time. The high-end homes were selling for around 50% off their highs. In fact, I sold a home that was originally listed for $875k, I sold this home for $385k. It was an absolutely goregous designer 6,000 new square foot home next to a river in Springville. High-end homes were just getting hit hard in 2009. The average sold price really dropped in 2009. 2008 - This was a bear market for real estate in Utah County. We managed to climb to 475 homes sold in August of 2008. The Utah County Realtors were selling about 200 less homes each month compared to the previous year. The average sold price of homes spiked again in August of 2008.